&quot;The Truth&quot; hip hop FREETHOUGHT artist- Show 12! 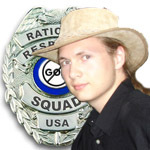 "The Truth" will be appearing on the Rational Response Squad in show 12. All three songs from his myspace page will be featured in Show 12. Also, "The Truth" has wrote a new theme song for our show that will shatter your brainz. From the myspace page of "The Truth:"
The Truth, of Tha Non Conformists, is spreading deep messages of truth in a world full of lies. Ultimately, it is messages like these that could help shape a better world for us all. In a genre that has become saturated with materialism and ignorance, this rap artist stands apart from his peers. The Truth's music serves as inspiration for movements of equality, change, and progression. Hence the name of his coming new album Movement Music. In addition to being a skilled and visionary rapper, he is an activist first and foremost. In 2006, The Truth met Relentless and Natural Disaster, the two other members of his group. Though shrouded in mystery, (the group claims to reside in a location referred to only as "Outside the Box" Tha Non Conformists music speaks volumes about what they represent. While bringing sonic mastery and skills comparable to or better than the most well known rappers, their music also gives you inspiration to do your part to help change the world. To listen to The Truth and Tha Non Conformists is to listen to what music is supposed to be - a venting outward of soulful expression - with a burning desire to make an impact on the world. Look for "The Truth" and his girlfriend (who likes debating Christians) to join us in the studio in the future to co-host the show. His songs will also be downloadable to members of this board soon. Yeah I like it, save for the fact that I go unmentioned again, same as in Proclaim's intro (I love that one too). Never no love for Yellow. Sorry Mike, if it's any consolotion, I really look forward to the scrutiny that "I'm a savior" will subject me to. Proclaim was high when he met us for the first time. "The Truth" didn't meet Mike, as he wasn't around for that recording session. Mike is my hero! He and I are very similar in that we are more reluctant to accept conspiracy theories, and are all about the science. I could probably host a show on free thought hip-hop. More and more of it is being brought to my attention. The only thing keeping me from do it is my natural affinity for metal and my long flowing black locks. Yeah, I sort of understand why I get no love in the theme songs, but it doesn't mean I'm not just a little bitter about it.